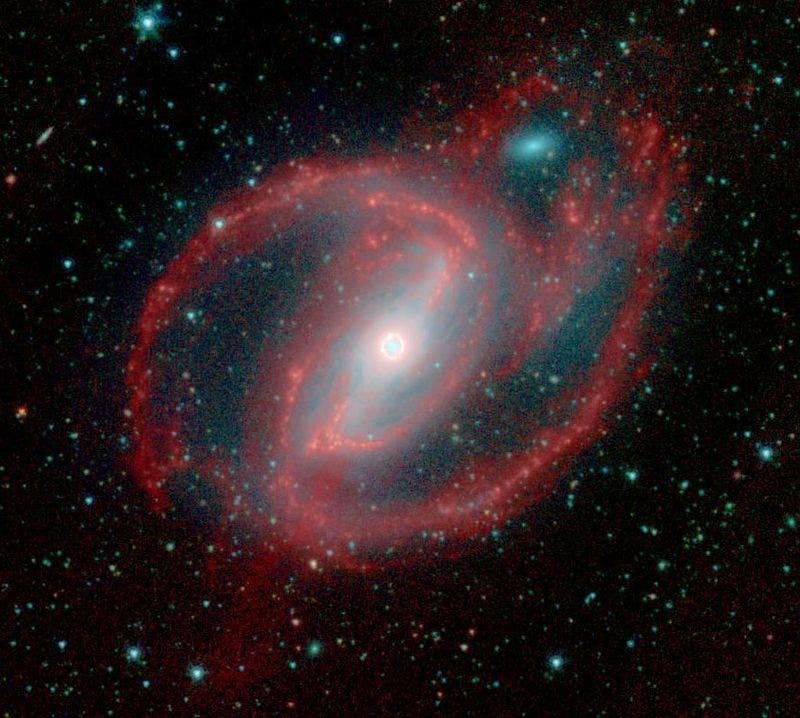 The odd spiral galaxy extends long arms of red stars into space. But Nasa said the black hole at the centre of the galaxy in which Earth is situated is tame by comparison to NGC-1097, with the mass of just a few million suns. "The ring itself is a fascinating object worthy of study because it is forming stars at a very high rate," said Kartik Sheth, an astronomer at Nasa's Spitzer Science Center. The galaxy's red spiral arms and swirling spokes between them show dust heated by newborn stars, while older populations of stars scattered through the galaxy are blue. A fuzzy blue dot to the left of the image shows a companion galaxy, while other dots are either stars in the Milky Way, or other more distant galaxies.